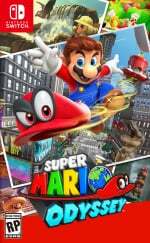 Finding every Power Moon in Super Mario Odyssey is quite the adventure; the amount of different methods needed to acquire a complete collection is staggering and you may find that you need a little bit of help along the way. 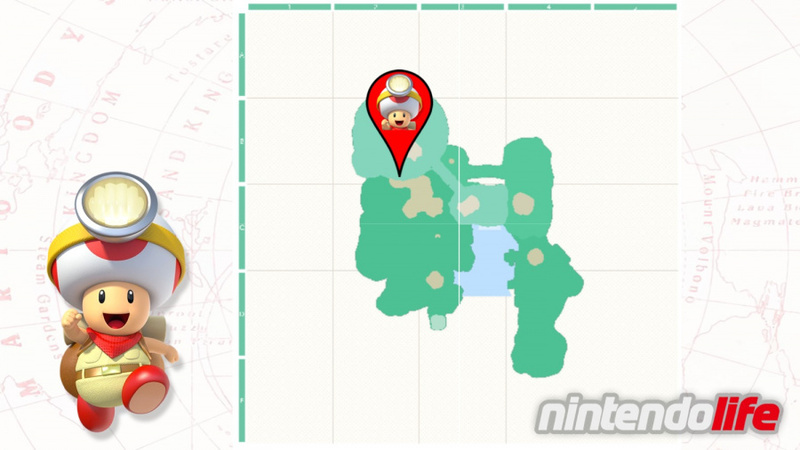 One of the many tasks you'll need to complete for a full set is finding every single Captain Toad location. Yes, Captain Toad can be found in 14 of Super Mario Odyssey's Kingdoms (usually after an area has already been cleared) along with that signature, shrill, shrieky, and yet oddly compelling yell that bursts out of his mouth at any given time. If you manage to find him you are rewarded with a shiny Power Moon to add to your ever-growing tally so, if you're ready to go on an adventure, let's track him down! Naturally, this guide contains several spoilers including post-game content - you've been warned! 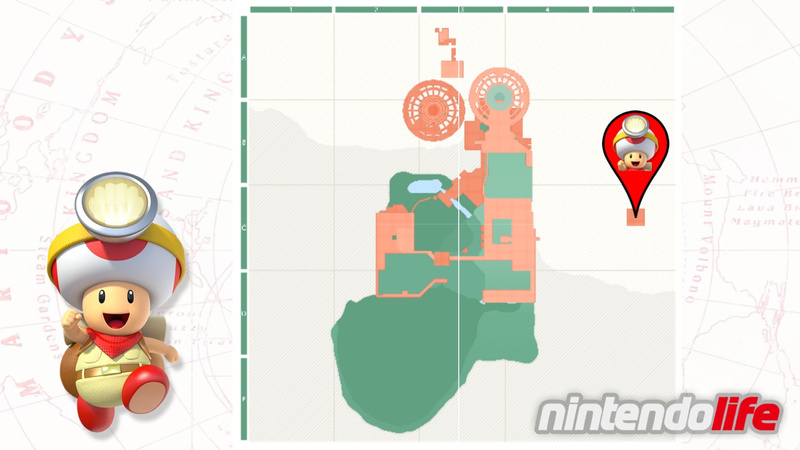 To find this Kingdom's Captain Toad, you'll first need to travel to the small body of water in the bottom-right hand corner of the map. You'll notice a Lakitu enjoying a spot of fishing but, unfortunately for him, his playtime is over as you need to capture him. As Lakitu, slowly float yourself away from the water in a northerly direction until you reach an area with three cacti and a noticeboard. Cast your line into the sand to attract the largest silhouette you can see - once you've caught it, use the left stick to reel it in and you'll find that you've caught yourself a nice, fresh Captain Toad. 'You're Quite a Catch, Captain Toad!' is yours! For this Moon, warp to the 'Water Plaza Entrance' and turn around 180 degrees so that you are facing the opposite direction to the plaza itself. Capture one of the many available Cheep Cheeps and swim back into the main Plaza entrance, making sure to splash along the floor inside until you can get yourself safely into the circular-shaped pool. With your new-found ability to breathe underwater, you will now be able to dive all the way down to the bottom of what turns out to be an incredibly long tunnel. Once you reach your destination you'll see Captain Toad sitting safely inside his own snow globe-like area. Talk to him to secure the 'Let's Go Swimming, Captain Toad!' Power Moon. In the Wooded Kingdom, Captain Toad is located on that tiny piece of land way out to the right-hand side of the map. To get there, you'll need to head to the nearest place available to it in the main body of land (warping to the 'Observation Deck' is your best bet here). From that checkpoint you should be able to see Glydon - the wonderfully cute, yellow dragon who can fly you around the map. Capture him and turn around to the left to find a thin piece of the scenery sticking out with some purple coins floating innocently at the end. If you walk to end of this platform you'll see that distant blob of land in front of you - simply glide down to it to meet Captain Toad and grab your 'Hey Out There, Captain Toad!' Power Moon. 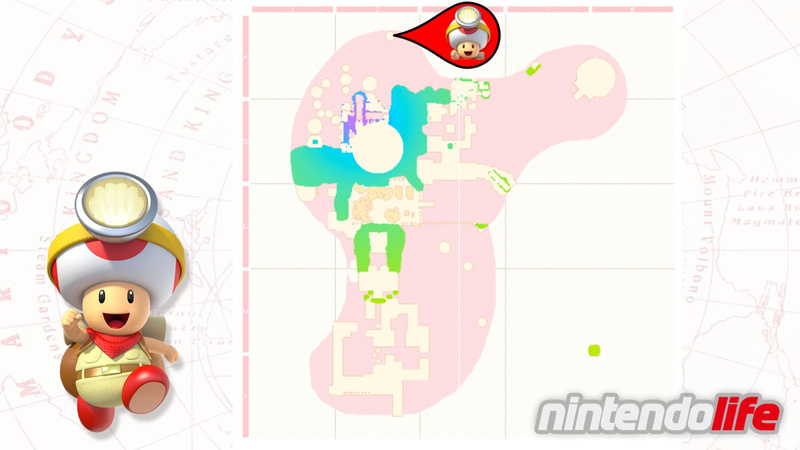 For the Lost Kingdom Captain Toad, you'll want to start by warping to the 'Mountainside Platform' checkpoint. From here, turn around and jump over to the area with gold coins hovering inside a square-shaped walkway, making sure to capture the Tropical Wiggler who is wandering around nearby. As the Wiggler, move your way over the platforms in front of you, dodging the Fuzzys along the way. Right on the opposite side you'll see a small platform with a single coin on it - head over to that platform and spin the camera around a little to reveal a small alcove on the green-coloured wall to the left. Use your Wiggler powers to wiggle into that space and find Captain Toad inside - as well as a small bank's worth of gold coins! 'Get Some Rest, Captain Toad!' is now safely in your possession. 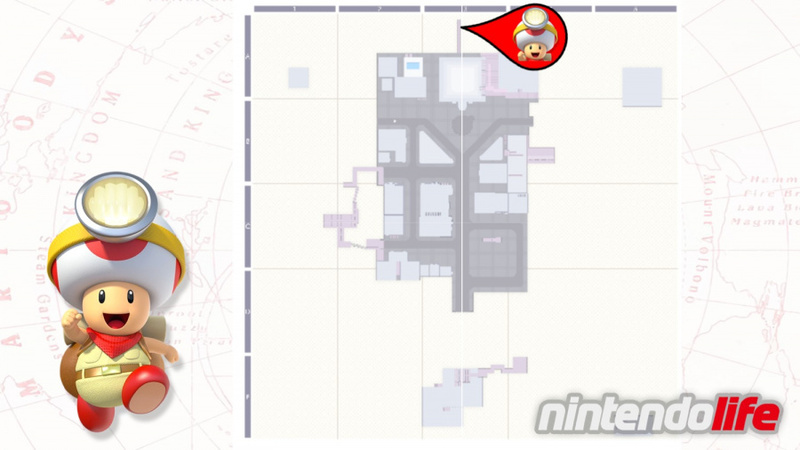 To find Captain Toad in the Metro Kingdom, start by warping to the 'New Donk City Hall Plaza' (the area where you can see Pauline standing outside). Simply run around the left-hand side of this building - passing a couple of human residents as you go - until you find a pile of cardboard boxes on the right. Jump over (or smash your way through) these boxes and you'll see Captain Toad sitting precariously on a fatally high platform to your left. Jump down onto the platform and run all the way along until you can talk to him - the appropriately named 'How You Doin', Captain Toad!' will be added to your collection. 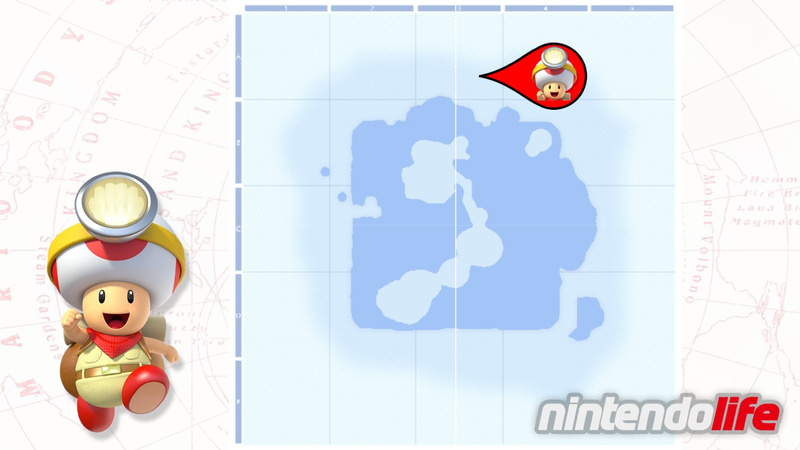 Captain Toad has hidden himself right at the top of the map in the Snow Kingdom so start off by travelling to the 'Corner of the Freezing Sea' checkpoint in the top-right. From the flagpole, make sure you're facing a north-westerly direction - immediately in front of you you'll see a thin channel of water leading into a pond and a snowbank just behind that. If you look carefully at the top of the snow you'll see an alcove that has been covered up. 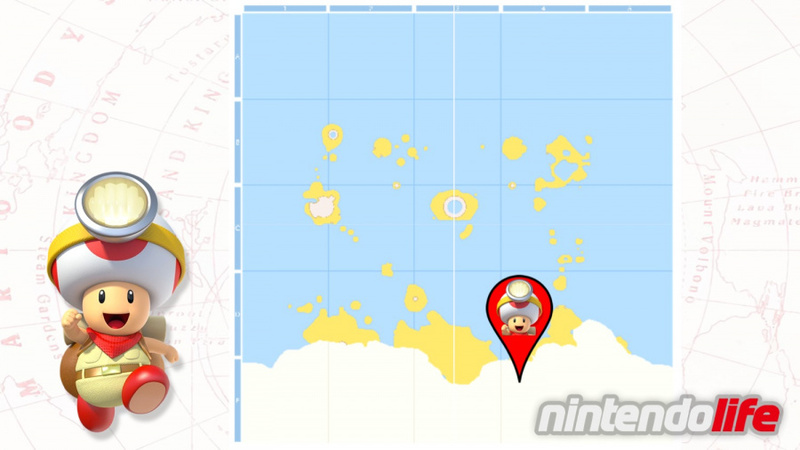 Head over there and smash away all of the snow to find Captain Toad 'chilling' (sorry) just behind it. Talk to him and you'll receive the 'Captain Toad is Chilly!' Power Moon. 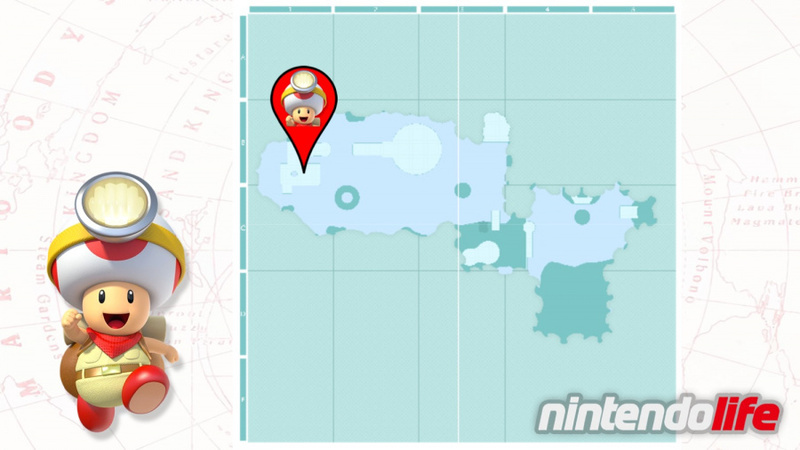 In the Seaside Kingdom you'll actually want to begin your search for Captain Toad from the Odyssey itself. Start by capturing a Gushen (one of those water-dwelling creatures that you can use to boost around with). Just behind the Odyssey there are some platforms sticking out of the cliff and one of them has a small body of water in it - head up onto this platform and land in the water to replenish your supply. From there you need to boost up, and then to the left, finding another small platform with a regular Power Moon sitting in open space (you're welcome). Using the same technique again, launch yourself skywards from this platform and continue your journey to the left. You'll need to fly around a slight corner in the cliff face before eventually getting your first view of Captain Toad's little platform. 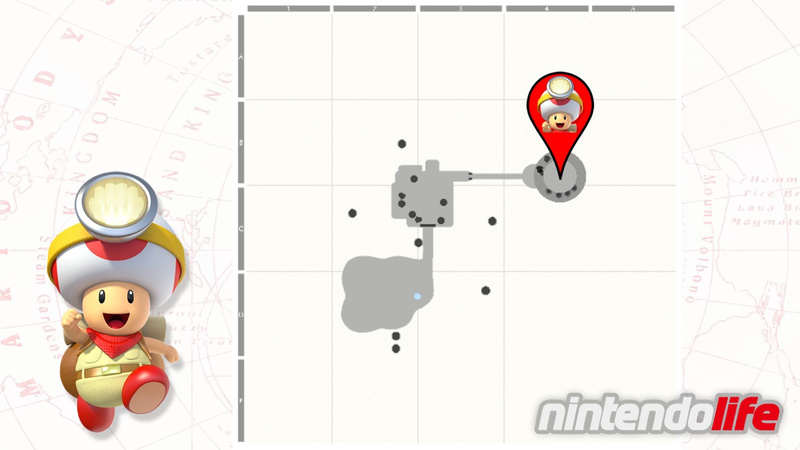 Land there and talk to him to get the 'Good Job, Captain Toad!' Power Moon. Good job, reader! As he was in the Wooded Kingdom, Captain Toad has somehow managed to find himself ridiculously far away from anything else of importance in the Luncheon Kingdom. As you can see, he is located at the very top of the Kingdom's map but you'll want to start by heading to the 'Start of the Peak Climb' checkpoint. From here, make your way up through the platforms in front of you, using the resident forks to flick yourself upwards. Keep climbing the mountain, passing the Fire Piranha Plant and the rolling fruit, until you eventually get the chance to capture a Lava Bubble. As a Lava Bubble, jump off the mountain into the pink goop below - this allows you to travel around a large chunk of the Kingdom freely. 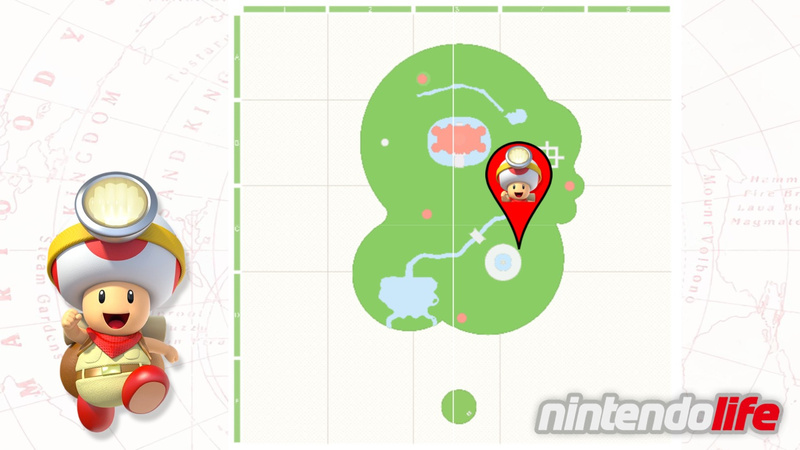 Swim all the way up to that northern point as indicated on our map above and you'll find Captain Toad sitting alone on a tiny island - engage in conversation and ta-da! - 'Bon Appétit, Captain Toad!' will be yours. In Bowser's Kingdom, start by heading to the 'Outer Wall' checkpoint. Run passed the huge Thwomp-like fella' and fall down onto the green roof tiles to the right-hand side. Climb up and over the next roof and you should see a group of three '?' Blocks to your left. Continue along the roof and jump down to the next available section on the left - Captain Toad is right there! Walk on over to him to collect your 'Good to See You, Captain Toad!' Power Moon. The Moon Kingdom doesn't really provide many places for Captain Toad to conveniently hide away so, luckily for us, he's rather easy to find. Starting at the Odyssey, head around to the back of the ship to find a small gathering of creatures from a variety of Kingdoms. They are all standing next to a small bump in the Moon's surface and, behind that small bump, you can just see the familiar sight of a red and white mushroom. 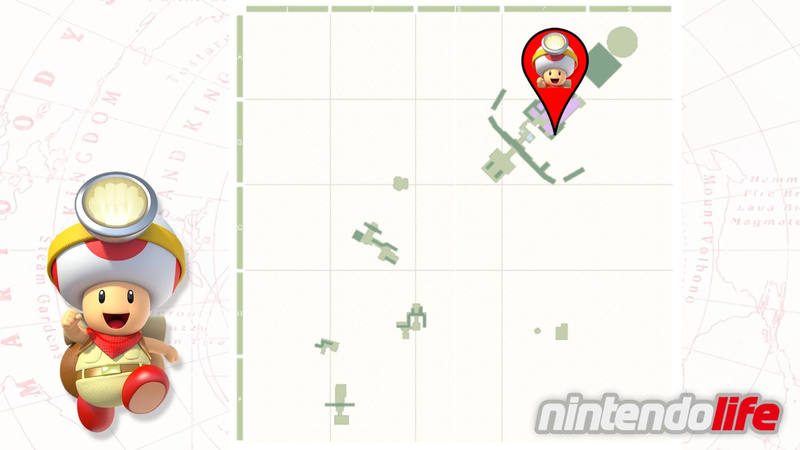 Jump over to have a chat with the little explorer and pick up the 'Thanks, Captain Toad!' Power Moon. 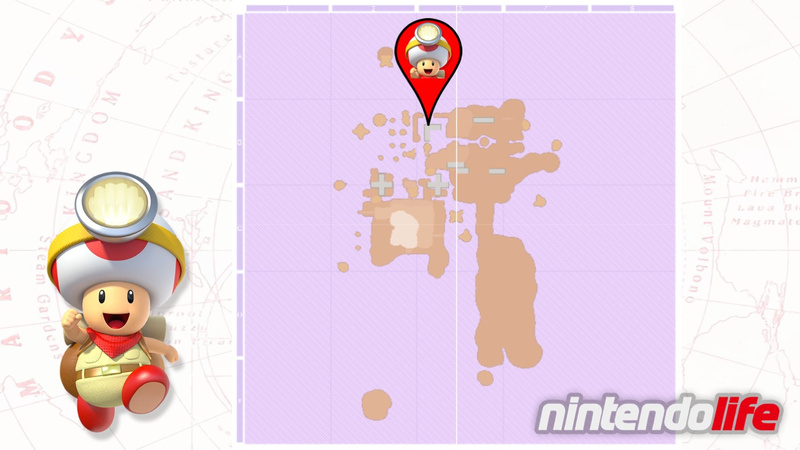 The Mushroom Kingdom is home to perhaps the easiest of the Captain Toad locations. Directly in front of the Odyssey (and to the left slightly) you'll see a water fountain with some purple coins on top. Just beyond that you'll see a mushroom-shaped building that is home to this region's Crazy Cap store. Sitting on top of the store is none other than Captain Toad himself. Simply jump onto the boxes just outside and perform a backwards somersault ('ZL' followed by 'B') onto the roof. 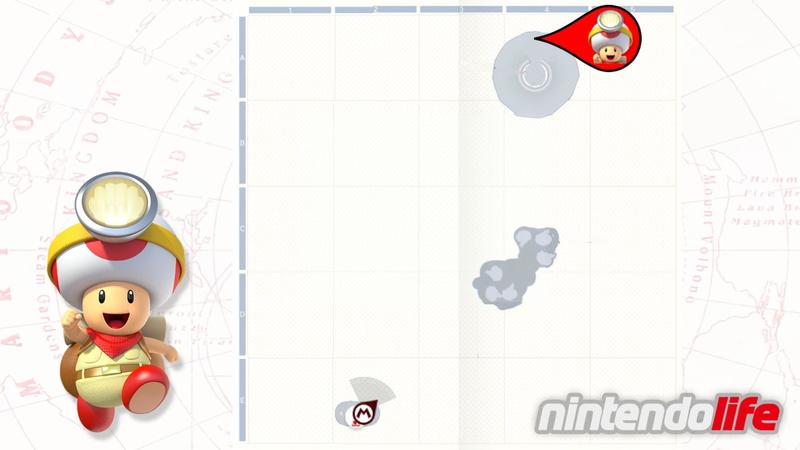 Say "hello" to receive 'Forever Onward, Captain Toad!'. One last Captain Toad to find! If you haven't yet unlocked Dark Side and are wondering why you can't travel to it just yet, don't worry! 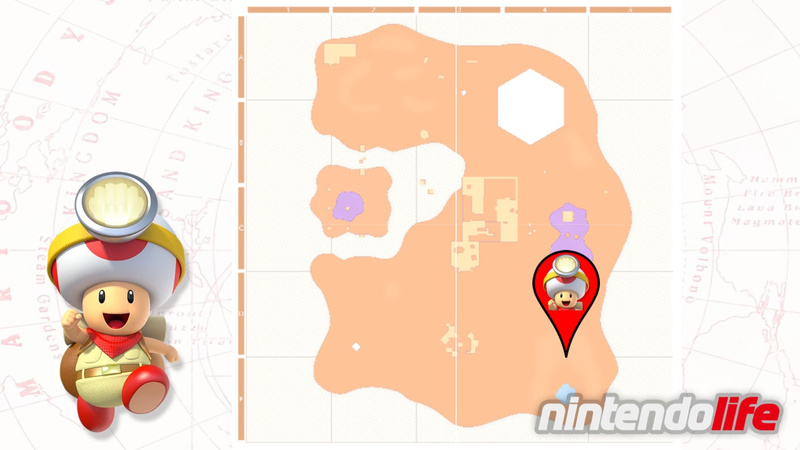 Once you have collected 250 Power Moons you'll be able to fly directly to this area and complete your Captain Toad treasure hunt. 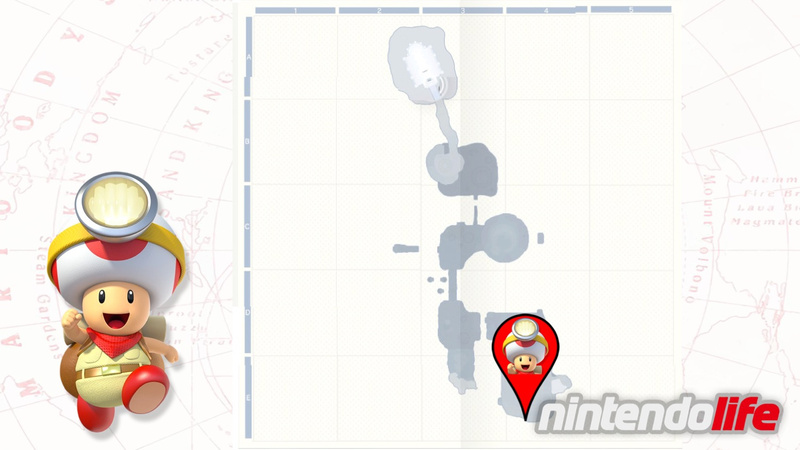 We hope that you have found this guide on where to find Captain Toad useful. Let us know if you've managed to track him down in the comments below. Dude is helpful, but wish it didn't put a mark on my moon list. I found him so far in each kingdom I've been in except cap kingdom. I haven't gone back there. I'm only at lost kingdom. You're welcome, Mario. Wait a minute, I am not shrieky! You are everywhere in Super Mario Odyssey. Be happy ! And yet more spoilery headlines for whoever hasn't played Odyssey. I really hope a Captain Toad sequel is in the works. Lovely spoiler for people that didn't know he was in the game. @The__Goomba Welcome to Nintendo Life. Seriously!!? way to ruin the surprise.